JHEdRA - Are you ready for the first course? Arthritis Consumer Experts (ACE) has launched its newest on-line patient education program called JointHealth™ Education. Designed to enable arthritis patients to progress from being a “student” of arthritis to full-fledged “graduate,” JointHealth™ Education empowers and equips them to be equal partners on their health care team. As part of the launch, ACE is introducing the first course in the program - JointHealth™ Education: Rheumatoid Arthritis - to help patients and their healthcare providers better understand each other’s motivations and goals for the patient’s overall treatment and care plan. “The RA Narrative Global Patient Survey represents the views of more than 4,000 RA patients around the world, and the views of their healthcare providers in the companion survey, were the road map for the development of JointHealth™ Education. The survey evidence reveals that a patient’s perception of their RA and its treatment, as well as their relationship with their healthcare provider, impacts the management and the outcomes of their disease. It also illustrates that, together, RA patients and their rheumatologists can better communicate and understand one another’s views to achieve the best possible outcomes for patients,” said Cheryl Koehn, Founder and President of Arthritis Consumer Experts and a member of the RA Narrative Global Advisory Panel. JointHealth™ Education was inspired by many of ACE’s members living with an inflammatory arthritis who have told us they lack the communications expertise to have full, satisfying conversations with their rheumatologists on topics such as treatment options during their clinical visits. The program was also informed by ACE’s participation on a global advisory panel that conducted a survey in 16 countries of rheumatoid arthritis patients and their health care providers. The results illuminate the communications gap between the needs, concerns and fears of patients compared to the views of their health care providers. These and other important findings from the RA Narrative Global Patient Survey led ACE to seek a made-in Canada solution that focuses on closing the “communication gap” between RA patients and their rheumatologist to help them work as equal partners in disease management. JointHealth™ Education provides current, evidence-informed lessons, quizzes and coaching videos through a secure, on-line classroom where arthritis patients progress from being a “student” of arthritis to full-fledged “graduate.” The program helps prepare patients to appropriately frame their health concerns and questions with their healthcare provider. Upon successful completion of a course, the patient “graduate” receives a certificate indicating they have the knowledge and communication tips needed to successfully prepare for their medical visit, talk to their health care provider about setting treatment goals and making an overall plan, discuss specific treatments (medication and non-medication forms), and manage and monitor their type of arthritis. The first course offered in ACE’s newest on-line patient education program is JointHealth™ Education: Rheumatoid Arthritis. When you sign up for a course in JointHealth™ Education, you are on your way to progressing from a “student” of arthritis to full-fledged “graduate,” helping you become an equal partner on your health care team. Because each of us learn at a different pace and through different educational tools, JointHealth™ Education’s lessons, quizzes and coaching videos are designed to allow people with arthritis to learn conveniently from home or during a break at work or school. When you successfully complete a course, you also gain access to other fact-based resources and communities, further supporting you to self-manage your disease in partnership with your rheumatologist or family doctor. How does JointHealth™ Education work? Are you ready for the first course? 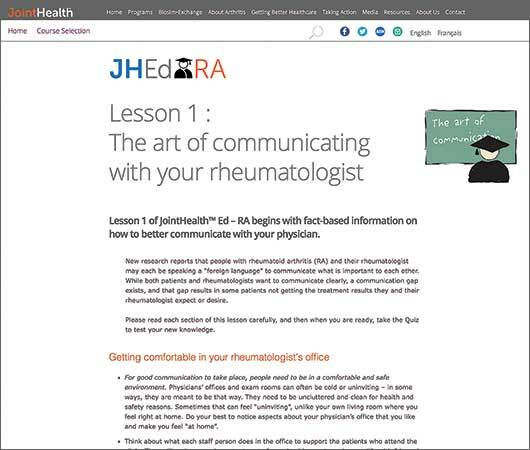 Now available online, the first course in the program - JointHealth™ Education: Rheumatoid Arthritis – is designed to help patients living with RA and their healthcare providers better understand each other’s motivations and goals for the RA patient’s overall treatment and care plan. Over the past 12 months, ACE received unrestricted grants-in-aid from: AbbVie Corporation, Amgen Canada, Arthritis Research Canada, Canadian Institutes of Health Research, Celgene, Hoffman-La Roche Canada Ltd., Innovative Medicines Canada, Janssen Inc., Eli Lilly Canada, Merck Canada, Novartis, Pfizer Canada, Sanofi Canada, St. Paul’s Hospital (Vancouver), UCB Canada, and the University of British Columbia.